Ribble Link Junction Footbridge is a minor waterways place minor waterways place place on the waterways major waterways place village town city on the Ribble Link between Ribble Link Lock No 9 (Sea Lock with rotating gates) (2 miles and 3 furlongs and 8 locks to the west) and Ribble Link - Lancaster Canal Junction (a few yards to the north). 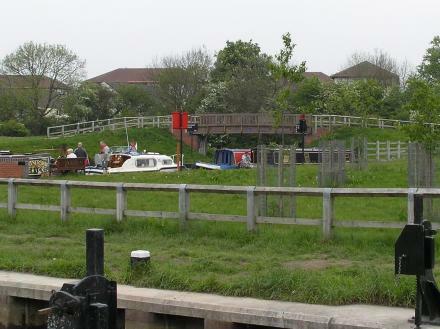 The nearest place in the direction of Ribble Link Lock No 9 is Ribble Link Locks Nos 1 to 3 (Three lock staircase); ½ furlongs away. The footbridge from the lock. Preston — 159 yards to the north. The Space Centre, 10 Pedders Lane, Preston, PR2 2TH — 1523 yards to the south. 1364 yards to the southeast. Preston — 1015 yards to the northwest. 35 Greaves town lane, Preston, PR2 1PD — 1460 yards to the southwest. Bristow Avenue, Preston — 939 yards to the southeast. Preston — 1437 yards to the east. 22 Woodplumpton Road, Preston, PR2 2LP — 1364 yards to the east. Preston — 1028 yards to the west. 414 Blackpool road, Preston, PR2 2DX — 1467 yards to the east. Preston — 1023 yards to the south. Preston — 1580 yards to the north. Preston — 830 yards to the northeast. Preston — 1321 yards to the south. Preston — 1163 yards to the southeast. Tom Benson Way, Preston, PR2 1SG — 796 yards to the west. Preston — 1347 yards to the southeast. 40 Lea Road, Preston, PR2 1TP — 1196 yards to the southwest. Preston — 1367 yards to the east. Preston — 1018 yards to the southwest. Preston — 1225 yards to the southeast. Preston — 966 yards to the northeast. 185 Tulketh Brow, Preston, PR2 2JD — 1604 yards to the southeast. Preston — 632 yards to the northeast. Preston — 1374 yards to the east. Pretty little Things "Professional K9 Grooming"
Leyland bridge barn, lea road, Preston, PR2 1RZ — 1328 yards to the west. Preston — 1635 yards to the northwest. Preston — 1224 yards to the southeast. Preston — 1578 yards to the southwest. 10 Pedders Lane, Preston, PR2 2TH — 1517 yards to the south. Preston — 994 yards to the west. Cowling lane, Preston, PR25 1XP — 1619 yards to the north. Ingol, PR2 3 — 1375 yards to the north. Larches, Preston, PR2 1 — 1347 yards to the southwest. Ashton, Preston — 1210 yards to the southeast. Greyfriars, Preston — 1323 yards to the north. Preston — 1334 yards to the northwest. 550 Blackpool road, Preston — 941 yards to the southeast. Preston — 1471 yards to the east. Preston — 1533 yards to the southeast. preston, London, PR2 1DY — 1193 yards to the southeast.